New product from WISMEC, Reuleaux RXmini TC MOD, which has 2100mAh battery, 80W output power, this box mod has 0.96-inch display screen, supports VW/BYPASS/TC-Ni/TC-Ti/TC-SS/TCR mode. With novel appearance and easy to use designs, it will be popular and attractive. Reuleaux RXmini TC MOD is a new product from the brand WISMEC. It has built-in battery 2100mAh with USB interface which can be recharged at any time. The maximum output power of the mod is 80W. The most brilliant feature is that it has 0.96-inch display huge screen, and supports a variety of modes, such as VW/BYPASS/TC-Ni/TC-Ti/TC-SS/TCR modes, the temperature control device gives Reuleaux RXmini mod a more wonderful taste, 510 thread can match for most tanks, there are 5 colors to choose, Black/Grey/Red/Silver/White. • Power on/off: Press the power button 5 times in quick succession to turn the device on and off. • Stealth function: While the device is on, simultaneously hold the fire button and the left regulatory button. This will switch the screen display on and off. • Key lock function: While the device is on, simultaneously press the "+" "-" buttons. This will switch between Key lock and Key unlock function. • Micro UBS port function:The USB port can be used for charging and upgrading firmware. • Switch the display mode: By pressing the left and right regulatory buttons simultaneously in shutdown state, the screen display will rotate 180 degrees. • Shift among VW/Bypass/TC-Ni/TC-Ti/TC-SS/TCR modes: Press the fire button 3 times, the mode indication will flash to indicate you enter into the menu. Press the right regulatory button to switch between VW/Bypass/TC-Ni/TC-Ti/TC-SS/TCR modes. Press the fire button or leave the display to flash 10 times on current setting to confirm and exit the menu. • Logo mode: When powered on, press the fire button and right regulatory button simultaneously and then you enter into the logo mode. By pressing the left and right regulatory button to choose between logo on and off, and press the fire button to confirm. 1. Long press the fire button and right regulatory button simultaneously to enter the menu. 2. Press the right regulatory button to enter the preheat setting menu. 3. Press the fire button to switch between preheat power and preheat duration. 4. Press the left or right regulatory button to decrease or increae the parameter. 5. Long press the fire button to confirm. • It comes with a Rxmini MOD only. The 2100mAh is enough. 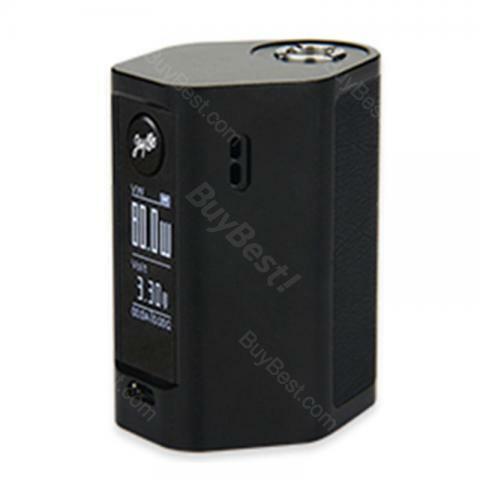 80W WISMEC Reuleaux RXmini TC MOD is the best starter kit at this price. The flavor meets the needs of mine. Die Optik ist sehr hochwertig. Die Handhabung ist als Laie denkbar einfach. Ich kann WISMEC Reuleaux RXmini wirklich jeden weiter empfehlen.